support and celebrate solo and small firm lawyers . Since then, so much has changed within the legal profession and for me personally. Just to take one example, the Yellow Pages are no longer the preferred form (by a wide margin) of lawyer advertising as they were according to this poll that I ran back in 2003. Offshoring work to India was still an outlier trend in 2003 ; by 2011, Thomson-Reuters had acquired Pangea , a leading India-based LPO. Other familiar players are no longer. Nolo Publishing – the great grandaddy of DIY Law and once a loyal sponsor of MyShingle (in return for which, I also penned a special Legal Marketing Blawg ) is no longer the radical upstart trying to expand access to law by providing self-help guides. Instead. all of Nolo’s beautiful educational resources are simply a huge source of content ripe for acquisition by an internet marketing company. Likewise, once venerable (albeit elitist) lawyer director Martindale Hubbell was bought up by the same group, a victim of competition with Avvo’s similar but more democratic ratings system. As well-known brands change hands, not everything changed for solos. Back in 2003 I advocated for loan forgiveness for solos who frequently perform “involuntary” pro bono and represent clients who most large firms won’t touch. Though neither Congress nor law schools have taken up this proposal, ever resourceful solos have found a way to share in the benefits of loan forgiveness by creating their own non-profit firms . Solos also continue to fight off competitors real and perceived. Back in 2004, before the economy imploded, solos and smalls feared displacement by full service big law firms that could provide clients with everything they needed all in one place – albeit at a high cost, and often at reduced quality if the firm didn’t specialize in all of those practice areas. Turned out, however, that when economic times grew tough, biglaw’s clients got going – either to India, to alternatives like Axiom and yes, big law partners realized that with the power of technology, they could hang shingles and compete for traditionally big firm clients. Today, solos and smalls still face threats. Only now, it’s from legal start ups and form fillers , hackademics who deride the work that solos do and even our very own ABA, which seeks to foist the burden for access to justice on solos . dissected since 2005, when most lawyers still hadn’t heard of blogging, and continues to generate comment. My take? Blogging is still around but it’s not what it was back in the heady days when I released MyShingle into the world. Back in 2003, the community was small and bloggers wrote from the heart, shared substance and debated with passion and without hard feelings. 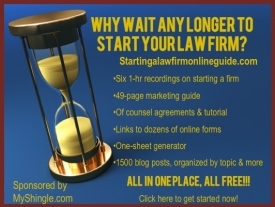 Sure, there’s something called blogging that big law does it’s really more of a law firm newsletter posted online, and there’s the SEO-driven, connect-the-keyword variant that you’ll find at many solo and small firm blogs. Don’t get me wrong – the free content is more useful than other types of advertising (memo to big law: the information published by teams of associates at big firm blogs is ripe for picking by solos like myself who use much of that content for free to serve our clients, not to refer you cases). But slick design and corporate content lacks the soul of a fresh blog post, flown fresh from ten passionate fingers careening down the keyboard at 100 words a minute. Blogging aside, technology continues to transform the legal profession. When I started MyShingle in 2002, I was working on a PC. It wasn’t until 2011 that a Mac lap top had declined sufficiently in cost and grew compatible enough with other legal programs used in my practice that I could justify the purchase . Now, the Mac is a top choice for solos. Meanwhile, the cloud – which was still called SaaS when I started MySHingle now dominates the law practice management scene, making practice management those who don’t use one of the full service pioneers like Rocket Matter, Clio or MyCase are still likely to use some type of cloud based product like Google Apps or Time59 for calendaring and billing – which increases efficiency and enables lawyers to focus more on clients. Even after all this time, I don’t think that we have even come close to tapping technology’s potential to improve both the quality and the quantity of legal services that solos and smalls deliver to clients. MyShingle hasn’t just been the place where I track developments in the legal profession; I’ve also used it to mark the passage of time in my personal life. My girls were 3 and 6 when I launched MyShingle, working late into the night setting up the site, feeling only exhilaration (fatigue would come later and I could often be found napping on park benches while my daughters frolicked on the playground). Now my little girls are grown up: my older girl is gone , and I’m already counting down the clock until her sister – already a 10th grader – will depart as well. As my daughter grew, my professional life went through different phases. With the arrival of my first daughter, I moved from an office space across the street from the White House to working a round-the-clock schedule mostly from home. I cut back on work further with my second and resumed a full-time out of the home office with an intern and part time associate when my daughters were in school full time. Say what you will about home offices – but the home office option and ability to be location independent kept my career from completely losing momentum while my daughters were young (though make no mistake – I still didn’t advance as far as I would have if I’d have worked a traditional full-time schedule) – and has now allowed me to continue working as my family’s sole breadwinner since my husband’s diagnosis of brain cancer six months ago. You never know what life will bring. Twelve years is a long, long, LONG time to stick to one thing — particularly during a time of explosive change, where the pace of technology is constantly creating new opportunities (case in point: take a look at many of the early stage bloggers who have built booming practices or successful businesses, or transitioned to other positions as a result of capital created through blogging). My pace of posting has slowed over the past few months, and I’ve considered taking a break . At some point, it will be time to move on, but not just yet. Because so long as there are ABA policies that incense me , practice tips that intrigue me, questions by other lawyers that remain unanswered about the ups and downs of solo practice, and most of all, so long as there are solo lawyers who amaze and inspire and deserve recognition – well, that’s reason enough to keep on blogging.